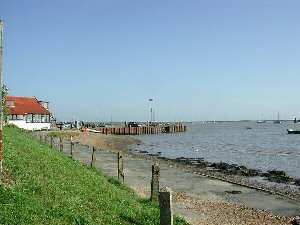 The village of Orford sits along the coastline of Suffolk. During medieval times its port was used for importing wine and exporting wool. Before there were any lighthouses erected along Orford's coastline, many ships were lost near Orfordness. The port was a good location for King Edward II's ships during his naval battle against France. The tiny River Ore was once navigable from the sea at Orford by the small ships of the 12th and 13th centuries. This channel was used to ferry the imported stone used in Framlingham Castle's construction from Northamptonshire and Caen in Normandy. The port is now used for leisure and fishing, with a ferry service available from the quay to the National Trust's nature reserve at Orford Ness.